The Bay Club Silicon Valley opens August 1, and it seemed an appropriate time to write a little about my personal impressions of the club. But even after my article ran, friends asked what I REALLY thought about it. Is it outrageously overpriced (no - it's not the cheapest place in town but it's not into the gouge-you territory); is it snooty (not at all - well, members will have some effect but the atmosphere feels good). Is it family-friendly? Yes, but not the ideal place if you have young children who want to swim, be in sports, etc. There's an urban feel to it, which the club understands well. I saw an article about an upcoming singles mixer there, which seems like an "ah hah" kind of marketing. And speaking of marketing, what was most impressive to me as a marketing professional is that when I told people I had toured it, no one said, "Oh, I didn't know there was a new club." The women in my neighborhood (about seven miles from the club) and friends of mine who live in Cupertino had all heard about the club. Just goes to show the power of great marketing. I met their marketing chief at the press tour, and she said they did several mailings to a radius of about 15 miles of the club. I think it is more than just the list, of course. Their materials were branded well, good sales tools - overall, I was impressed. So far as whether you should try it, if the location works for you (off 280 on Wolff and DeAnza in the Vallco Shopping Center) you should definitely stop by for a tour. Real Moms Love to Eat author Beth Aldrich sent these healthy eating tips, and they seemed like such good, common sense advice I wanted to share them. I've shortened the tips, just because of the limits of reading on a blog, but if you like her thinking, follow her on RealMomsLoveToEat.com. Aldrich describes her philosophy as falling in love with your food. The full title of her book is actually: "Real Moms Love to Eat: How to Conduct a Love Affair with Food, Lose Weight and Feel Fabulous." It’s wonderful to take pleasure in food, she says. It’s even OK to eat the things we shouldn’t every once in awhile – just be sure to savor every bite. Aldrich makes the point that, “Eating in front of the TV is not savoring." • Make it all about YOU: Get back to the basics, remembering the pleasure inherent in the food experiences of your childhood. Think of the simple joy you had crunching into a sweet apple. • Get naked with raw foods: Our earliest ancestors were hunter-gatherers who foraged for and consumed a wide variety of caloric intake, mostly consisting of raw veggies. Your body will thank you not long after you include more raw food into your diet. • Tame your cravings dragon: One of the swiftest paths to an unhealthy snacking binge is ready-made, highly-processed sweets and baked goods. The craving-attack occurs when moms are busy and haven’t planned their meals for the day and it leads to a spike in blood sugar, a crash and then – another monster-sized craving. Have healthy options ready to go. Nutrient-dense whole grains such as quinoa, whole-grain toast with sesame butter, and oatmeal will turn that dragon of yours into a pussycat in no time. • Hungry for more lovin’? : Think you could force yourself to eat an ounce of dark chocolate every day? High-quality dark chocolate – the kind that doesn’t have all the fillers – actually has lots of benefits, not the least of which is … it’s chocolate! Dark chocolate contains natural chemicals that serve as mood boosters and elevate serotonin levels, which enhance our sense of well-being. Health benefits range from keeping blood vessels elastic to increasing antioxidant levels. “The wrong way to look at the whole-food diet is as an obligation,” said Aldrich. I've been thinking about how hard it is to make reasonably simple, healthy summer recipes on the grill (though I love veggies, I've never been taken with them on the grill). Here's a recipe that I haven't tried yet, but it was sent to me by Lisa Lillien, a.k.a. Hungry Girl, the NYT bestselling author and famed Food Network and Cooking Channel TV star. She recommends House Foods America’s Premium Tofu which she says is ideal for grilling. The kebabs are full of protein (which helps rev up the metabolism in the - ahem - over 50 body) so it sounds perfect for my next grilling adventure. Pat tofu block dry. Lay it on a dry surface with the shorter sides on the left and right. Vertically cut into 4 even pieces. Horizontally cut each piece into 4 even pieces, for a total of 16 pieces. Transfer to a plate, sprinkle with seasonings, and refrigerate for 15 minutes. In a medium bowl, thoroughly mix teriyaki marinade or sauce with chili sauce. 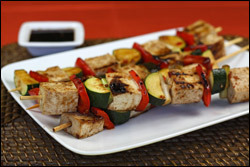 Alternately thread tofu and veggies onto four skewers, tightly packing the pieces together. Bring a grill sprayed generously with nonstick spray to medium-high heat. Lay kebabs on the grill and brush with about 1/3rd of the sauce mixture. Grill for 5 minutes with the grill cover down. Gently flip kebabs. Brush with another 1/3rd of the sauce mixture. With the grill cover down, grill for 5 - 7 minutes, until veggies and tofu have slightly charred. Serve brushed with remaining sauce mixture! Healthy Girl Alternative! Cook your kebabs on a grill pan, and adjust cook times as needed. If the pan doesn't have a lid, just loosely cover it with a skillet lid.